Ariana Grande poked fun at her recently ended engagement to Pete Davidson in her "thank u, next" burn book, but now she's starting to erase the signs of the whirlwind relationship. She's covered up one of her Pete-related tattoos with a tribute to one of her other famous exes. Overly attentive fans noticed some altered ink in Grande's recent behind-the scenes "thank u, next" video. 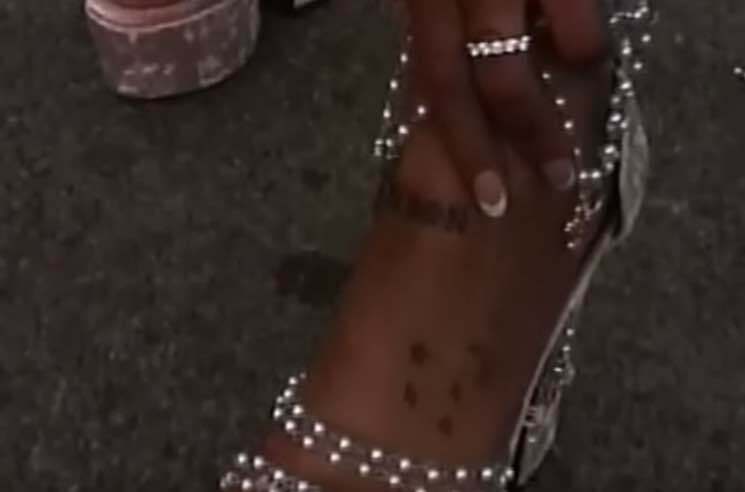 The singer appears to have covered up Davidson's late father's New York City Fire Department badge number with "Myron" on her foot — the name of Mac Miller's pitbull, which has been in Grande's care since Miller died in September. Grande has also covered up a "Pete" tattoo on her finger — first with a band-aid, and then with a permanently inked heart. For his part, Davidson has also been eliminating an array of Ariana-inspired ink, including the Dangerous Woman bunny logo on his neck. It's unclear if he's still got the full-torso portrait of Grande's pet pig, Piggy Smallz. See the full behind-the-scenes video (complete with audio of Grande and co. talking over the music) below. She shows off her "Myron" tattoo around the 2:30 mark.